At Kalyan Infotech we value your privacy. The only response you will get to any enquiry will be directly related to that enquiry. 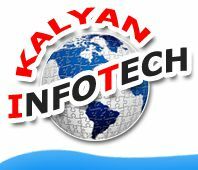 Your email address will categorically not be passed on to anyone else and it will only be used by Kalyan Infotech in relation to this single enquiry. It will categorically not be included in any mailing list at Kalyan Infotech nor will it be passed to any third party for this purpose. While designing your website we may have access to some of your personal or sensitive information. This will only be used as necessary in the construction of your website or other service that you have sourced from Kalyan Infotech.